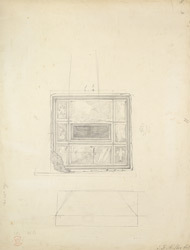 Drawing of what is presumably a tomb. This may be from Kilarrow monastery or parish church on Islay in the Hebridies. Although faint, the drawing shows decorative carvings of doves, fishes etc.